A circuit judge refused to allow Steve Oshiro to take back his no-contest plea yesterday and sentenced the former Roberts Hawaii bus driver to 20 years in prison for manslaughter. Steve Oshiro was sent to serve a 20-year prison term after he caused a collision two years ago that killed 42-year-old Corey Voss. 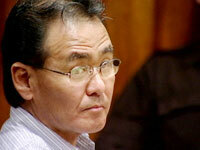 Oshiro, 50, chose not to make a statement at sentencing, either directly or through his lawyer. He pleaded no contest in January to manslaughter for causing the June 2006 death of 41-year-old Corey Voss in a head-on collision on Kamehameha Highway. As part of his plea agreement, the state promised to recommend to the Hawaii Paroling Authority that Oshiro serve no more than 10 years in prison before he is eligible for parole. But with a new lawyer, Oshiro last month blamed the crash on his boss for refusing to allow him to go home in the morning before he drove his bus into Voss' sport utility vehicle in Kahaluu. He also claimed that his previous lawyer did not fully explain all the legal implications of his plea agreement, that his new lawyer discovered new evidence and that the plea agreement is void because it contains a provision that is unconstitutional. Oshiro's relatives said previous lawyer David Hayakawa told them Oshiro could automatically withdraw his no-contest plea anytime before sentencing. Hayakawa testified last month that while he didn't explain to Oshiro the legal requirements for withdrawing the plea, he never told anyone that he could automatically withdraw the plea. Oshiro's new lawyer, Michael Green, said he discovered that, contrary to what police and prosecutors had suggested, Oshiro did not refuse to submit to drug and alcohol testing on the day of the crash. He said Oshiro did submit a urine sample, but officials at Castle Medical Center could not test it because they mishandled it. And Green said the plea agreement is void because it states that if Oshiro were to withdraw his plea prior to sentencing, he would remain in jail without the opportunity for bail pending the outcome of the trial. He said that provision is unconstitutional because it punishes Oshiro for exercising his right to trial. City Prosecutor Peter Carlisle said he included that provision to discourage Oshiro from doing exactly what he attempted. "The change-the-lawyer game is played by a lot of defendants far too often," Carlisle said. "They go from lawyer to lawyer to lawyer to lawyer. And that needs to stop." Circuit Judge Dexter Del Rosario said he believes Hayakawa did not misrepresent to Oshiro the terms of the plea agreement, that the new evidence does not clear Oshiro of blame and that he is not persuaded by Green's arguments that the plea agreement is void. He said when defendants enter into plea agreements, they waive whatever constitutional rights the state includes in the agreements and that defendants can accept or reject them. And based on Hayakawa's testimony, Del Rosario said he believes "the impetus for the defendant seeking to change his plea was his dissatisfaction with the sentence or his family's dissatisfaction with the sentence." Hayakawa had testified that Oshiro's relatives approached him only after they learned of the prison sentence Oshiro agreed to. Green said the lawsuit Voss' family filed against Oshiro and Roberts Hawaii has been settled. Green said he will appeal Del Rosario's ruling and hopes to take the case to trial.